If you see these cosplayers at a convention, please do not shiv them in their necks. Going to San Diego Comic Con this week? Or maybe just planning your next convention adventure? 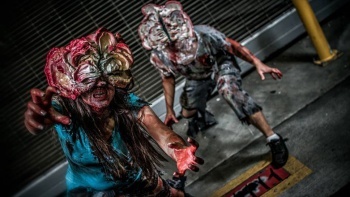 Instead of cosplaying as a standard superhero or classic movie character, here's a new costume idea: the horrifying clickers from The Last of Us. Just look at the detail in the face fungus! The torn clothes! The bloody teeth! Actually, maybe don't look too closely, unless you want to have nightmares. For those who haven't played The Last of Us and experienced the sheer horror of hearing a click-click-clicking in the dark, Clickers are an especially deadly form of the infected. They're blind, due to the aforementioned face fungus, but very stealthy and hard to kill, especially if you're blindly shooting in a terrified panic. Not that any of us have ever done that. The dedicated cosplayers are Amie Lynn and Richard Roth, with photos by Mike Rollerson. Impressive work, guys; I'll be sure to run screaming in the opposite direction if I ever see you on a convention floor.